Three words. Cookie Butter Popsicles. Or, hey, if you really want to get specific, Trader Joe’s Speculoos Cookie Butter Popsicles. 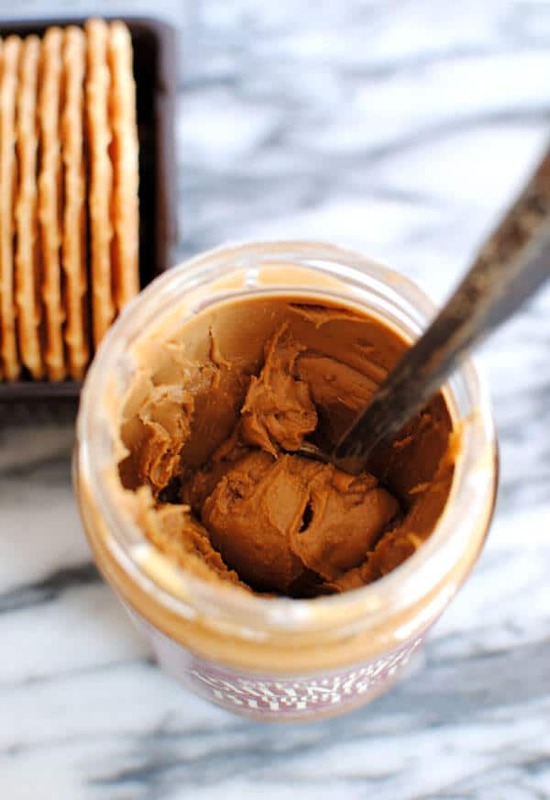 If you know what Cookie Butter is, jump on down to the recipe. If you don’t, you’re in for a treat! Let’s start with a fact: Cookie Butter is not allowed in my house anymore. A few weeks ago, when I was contemplating what to make for Wit and Vinegar’s Popsicle Week, it came to mind. I’d always heard about and how delicious it was, but I hadn’t actually ever tried it. So first, the taste test. 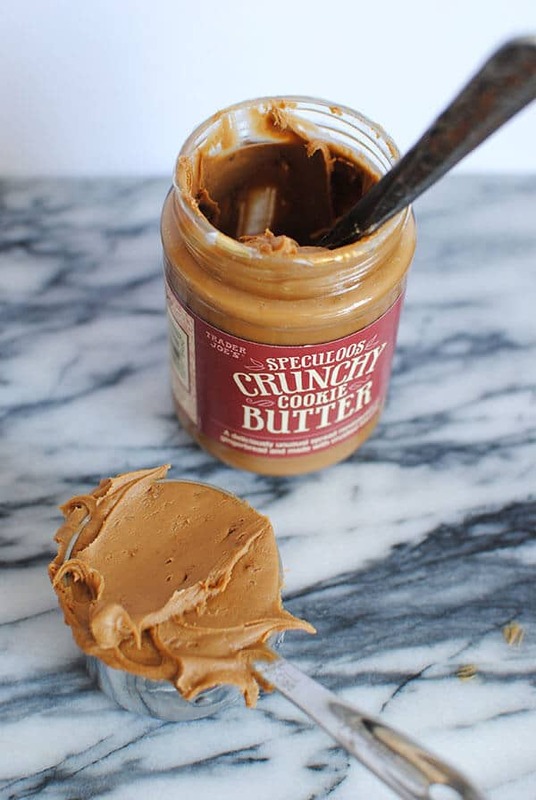 Turns out Trader Joe’s Speculoos Cookie Butter has the consistency of peanut butter and is made from crushed speculoos cookies. Speculoos cookies – also known as Speculaas or Dutch windmill cookies – are crispy cookies made with a spice mix of cinnamon, ginger, pepper, cardamom, cloves, and nutmeg. They taste similar to gingerbread, but they’re sweeter. They’re also my second favorite cookie. next to florentines. If you’ve ever flown Delta and eaten the Lotus Biscoff cookies, you’ve tried speculoos. Biscoff also has their own speculoos cookie butter spread. And, truth be told, I once thought these were special cookies that you could only get on Delta flights. You can imagine my joy/horror when I was standing in an aisle in World Market and discovered that this is not the case. And then I heard about cookie butter. And, finally, last week, I tried it. Oh no. This stuff is amazing. It had to make it into a recipe if only to slow me down from eating the whole jar in a manner of days. 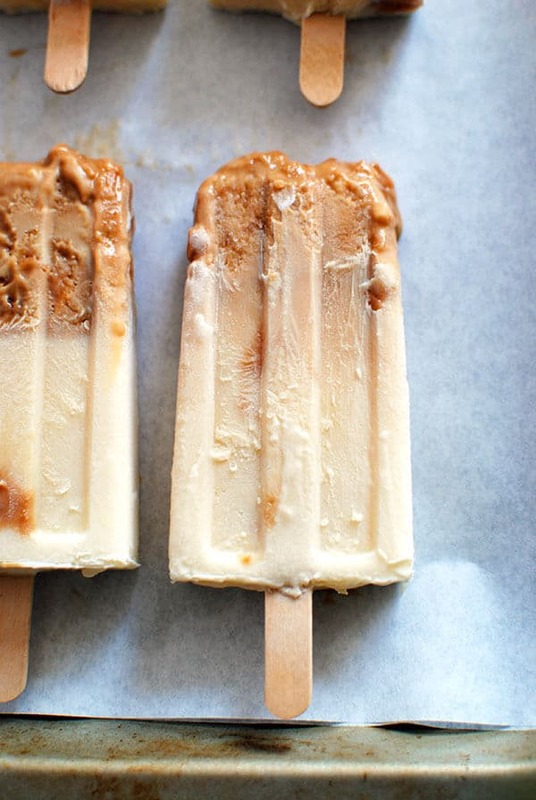 It’s not allowed back unless I’m making these Cookie Butter Popsicles. 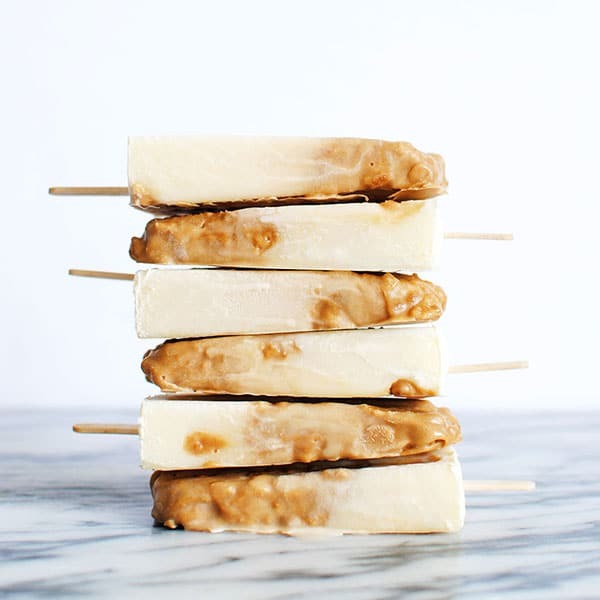 Making Cookie Butter Pops is super simple. Especially because you don’t have to make the cookie butter from scratch! I mean you could, but I’m not going to teach you because I don’t want to know. Sorry. I need it to live at the store until I make these. Making most popsicles is generally pretty easy. Sure, sometimes have you to create a custard, and sometimes you have to freeze layers for a pretty striped effect, but on balance, it’s easy. To make popsicles, you just mix a few ingredients together on the stove or in a blender, pour into your molds, add sticks, and freeze. You can make fruit and yogurt ones like these sweet Strawberry Dragonfruit Popsicles and Basil Lime Popsicles. 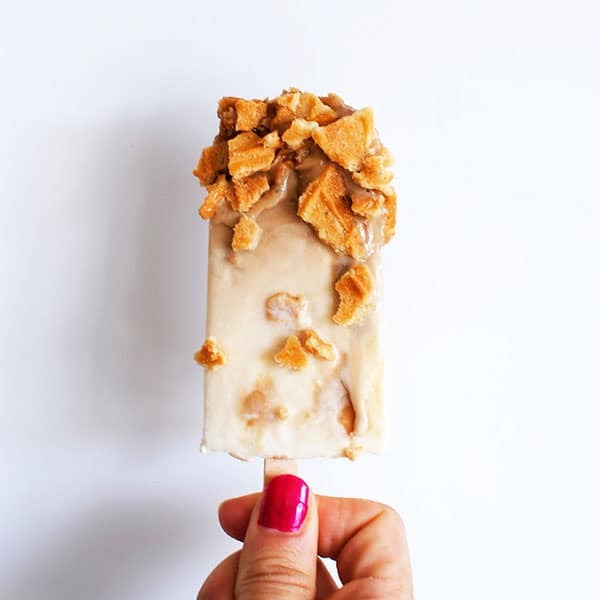 Or you can go the creamy route like I did with these Cookie Butter Popsicles and the Cereal Milk Popsicles I’ll be publishing soon. Those are chilling in the freezer as I write this. 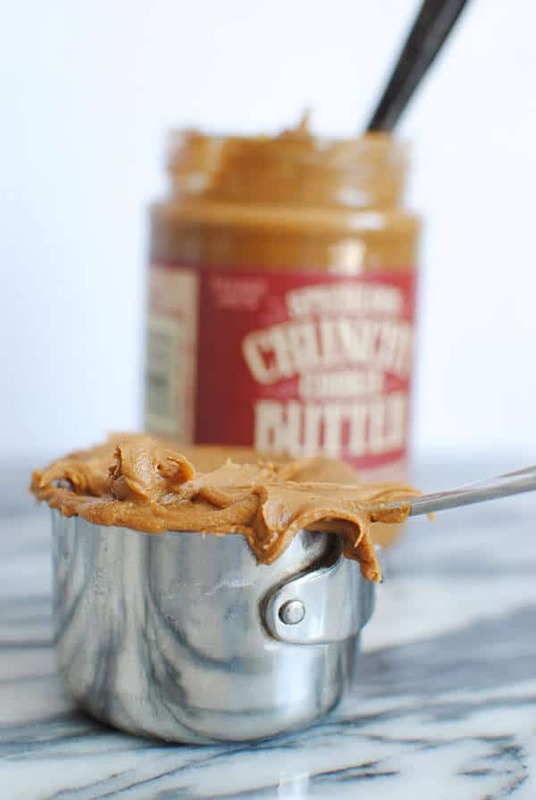 To make the Speculoos Popsicles, scoop 3/4 cup of cookie butter into a medium saucepan. Add 1 3/4 cup milk, and 2/3 cup heavy cream. Warm the mixture on medium heat and whisk until smooth. Remove from heat, mix in 5 crushed butter cookies – I used Trader Joe’s Belgian Butter Waffle Cookies – pour into popsicle molds, add popsicle sticks, and freeze. When frozen, you can dunk them in more crushed butter cookies for more crunchiness. We decided to take cookie butter to the next level with these cookie butter (speculoos) popsicles that have even more cookies in the recipe! Place cookie butter, milk, and cream in saucepan. Heat on medium until warm. Remove from heat and add cookies.